It is not so very long ago that Red Bull were the kings of Formula 1, winning four straight drivers' and constructors' titles between 2010 and 2013. They were crushed by Mercedes last season and continue to fall short of their high standards in 2015, although there are at least signs of a recovery, in particular their double podium finish in Hungary on Sunday. But a fundamental lack of outright pace remains, and in frustration Red Bull have turned their ire on Renault, laying the blame for their troubles firmly at the feet of their engine suppliers. Red Bull boss Dietrich Mateschitz said last month that Renault's lack of performance was draining his "will and motivation" to stay involved in F1. It's a fact that Renault are struggling, with both reliability and performance below par. Now there are rumours that Red Bull are seeking a different engine supplier for next season. Renault Sport boss Cyril Abiteboul admitted he, too, has heard the rumours but said he has "no accurate information" as to whether they are true or not. With a contract with Red Bull for next season, Abiteboul conceded he is "not very happy with the product" he is giving the team. But he added: "Frankly, we know Red Bull very well and the behaviour we see now is no different to the behaviour we had in 2008 or 2009. "It has always been like this since we were working together. They try every single thing they can to have the performance they desperately want, not the day after tomorrow but tomorrow and, if possible, today." Whatever the future holds, Abiteboul pointed out that Renault's expertise in helping Red Bull dominate was critical, especially surrounding the use of exhaust-influenced rear aerodynamics. How bad have relations got? They were already frayed last year, but they hit rock bottom following a poor start to 2015. Red Bull team principal Christian Horner called the situation "unacceptable", while design chief Adrian Newey went even further. Widely regarded as the greatest F1 designer of his era, Newey said there was "no obvious light at the end of the tunnel". Tellingly, he added: "It's one thing being in the position where you're not competitive but you can see your way out of it, it's another thing when you're not competitive and your partner doesn't seem to be willing to engage." That criticism drew a strong response from Abiteboul. "I understand the frustration, but I cannot understand how we deal with the situation," he said. "It is a difficult job to be an engine supplier, in particular to a team that has been so competitive and that is so high maintenance as Red Bull." Have Renault been harshly treated? The message from Abiteboul is clear: You owe us a bit more respect than you are showing us after what we helped you achieve. He also says Red Bull should take note of Renault's history and standing. "We have been in the business of motorsport for more than a century," he said. "We have been in F1 in one way or another for more than 37 years. They have been in F1 for maybe a decade maximum. "This is a big difference between the two companies, so I think we need to understand each other's mindset and the world in which we operate. "The key success factor to an ongoing collaboration is to be capable of understanding the partner's world, culture, working practice and so on. We are trying to do that with Red Bull. "I would like them also to understand a bit more of our world, the world of engine manufacturing but also car making and industry." Does a contract mean much? Despite the rumours that Red Bull are looking for a new engine partner for 2016, Abiteboul is calm. "It is a free market, but that doesn't mean that in a free market you do not have contracts you are supposed to honour," he said. "Clearly we will be honouring our contract and we are already building parts for engines for next year." And Red Bull's official stance? They declined to say whether they were actively seeking a new partner for 2016. However, Horner has said: "We have a contract with Renault until the end of 2016 and what we do after that we have to decide." If not Renault, then who? Mercedes, obviously, given they are now the team to beat. Ferrari, too, have an engine that is pretty much equal to the champions'. Mercedes team boss Toto Wolff declined to comment when asked whether Red Bull had formally asked them to supply them in 2016. However, he implied that he would not want to be involved in helping them break a contract. 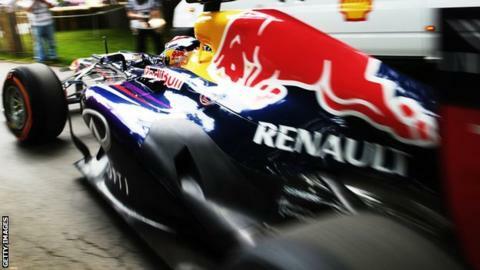 "Red Bull is a great brand and you can never say never," Wolff said. "But I am aware they have a contractual relationship with Renault." As for Ferrari, president Sergio Marchionne said in June that they would supply Red Bull if they were left without an engine. But that comment was based on the possibility of Renault pulling out of F1 after 2016 and insiders say Red Bull have not approached Ferrari. An "ongoing collaboration" between Red Bull and Renault is unlikely. Renault's attempts to improve its engine this year have been hindered by early-season reliability problems. And every time a manufacturer uses more than its permitted number of engines, grid penalties come into force. Red Bull have already been punished - and there is the promise of more later this year - but Abiteboul is upbeat. "There will be an improvement on the engine in the course of this season and I really hope this will be the type of upgrade that is visible to everyone," he said. Insiders say that the single-cylinder development engines on the test bed at the Renault Sport factory near Paris are showing an improvement in performance in the region of 2-4%. If the higher of those figures translates to the full-size engine, it would reduce the gap to Mercedes to less than 20bhp - a good stepping stone as Renault push for further gains into 2016. While Horner publicly urges Renault to deliver performance as quickly as possible, there is a weariness to his comments. What does the future hold for Renault? Red Bull and its junior outfit Toro Rosso are Renault's only customers. If Red Bull jumps ship at the end of the season, Abiteboul admits that Renault would effectively be forced out of F1 unless it buys its own team. "We have made no secret that we are not very convinced by our current involvement with F1," he said. The issue is the lack of exposure the Renault brand gets from supplying Red Bull - and the grief that comes with it. While winning eight world titles under the previous V8 engine formula, a difficult relationship was manageable, according to Abiteboul. The relative lack of return was acceptable, too, because costs were relatively low. But that's all changed now. So will Renault buy its own team? Being an engine supplier may not be enough for the car manufacturer. "The only way you can justify investing a lot is to have high marketing return," said Abiteboul. "Maybe we cannot obtain that type of value by being an engine supplier, in particular to a team that has such a powerful brand as Red Bull." Renault is considering three options for beyond 2016: continuing as an engine supplier, quitting altogether, or becoming a team owner again, as it was when it won the world title with Fernando Alonso in 2005 and 2006. Abiteboul insisted that "absolutely nothing is decided" but inside sources say the Renault board has agreed in principle to buy back what is now the Lotus team and rebrand it. And will that solve its problems? The key to buying Lotus will be structuring a deal that is acceptable to both Renault and to its current owners. Renault sold the Lotus team to Genii Capital at the end of 2009. Since then, the owners have ploughed millions into the team, which is now saddled with significant shareholder debts. Abiteboul said owning a team is "not a straightforward business case" and that Renault is "extremely mindful of the level of spend that is needed to perform as we want to perform". But he also insisted that Renault will "be able to secure new customers" if it remains in F1, in whatever form. "The only question," added the 37-year-old Frenchman, "is do we want it? And that question, for the time being, is unanswered."